Starting now, my Iron Man posts will be out of 10, as there is no possible way I’d get Mora to max before Warlords hits. In any case, with school starting, I haven’t had as much time to play, but I spend most of my weekends in Azeroth. Finally, my dear, sweet, precious Moragolden dinged 40 last Friday. I spent about 10 levels in a given zone up until 30 – from 30 to 40, I went through Arathi, Hinterlands, and about half of Western Plaguelands. Then again, I am doing most quests at green difficulty, so it’s not really that surprising that it took me a while. Northern Lordaeron may be my favourite area to quest in post-Cata. Between Hillsbrad, Arathi, Hinterlands, Ghostlands, both Plaguelands, and Eversong, I could take every Hordie of mine through here and never get bored. In fact, I’ve leveled 5 characters through Hinterlands, and I know that I’ll be bringing at least 2 more through there later. I’d like to get Mora up to 50 by the time Warlords hits – you know, a nice halfway checkpoint – and then focus on leveling my other girls and experiencing new content, rather than worry about leveling her to max. Now that 6.0.2 is up, I’m going to be spending a lot of time in the Barbershop, and a lot of time getting Deathdaisy through the content from this patch. Unfortunately, that means for the next few days, Mora is going to have to take a back seat. 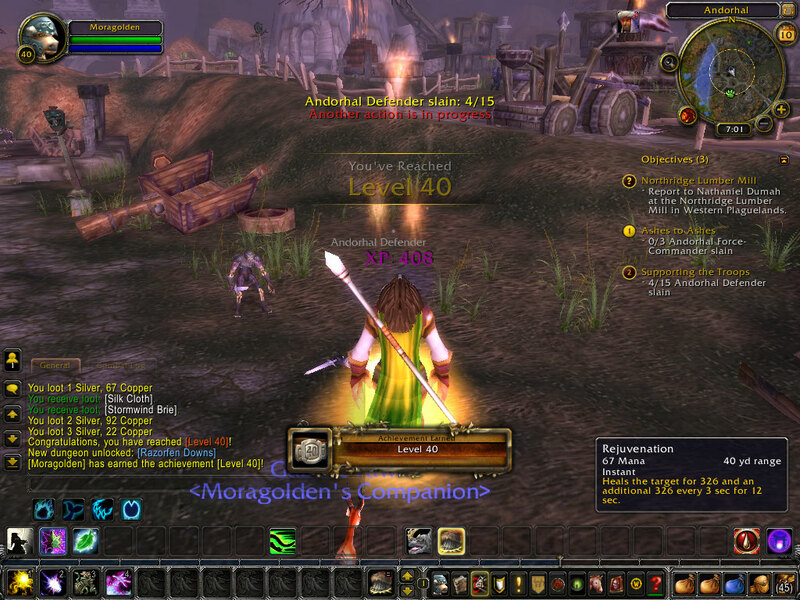 In any case, congrats Mora for leveling, and I hope everyone has fun in 6.0.2!